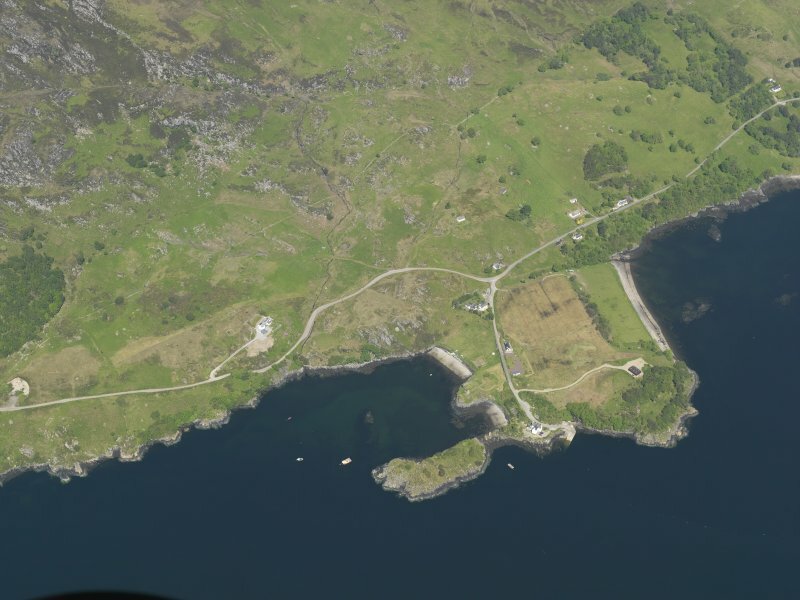 Oblique aerial view centred on the remains of Strome Castle, taken from the S.
Strome Castle is first recorded in 1472 as a stronghold of the Lord of the Isles. In 1503 its reduction was undertaken by the Earl of Huntly to whose family it was granted by Queen Mary in 1546. It was blown up by Kenneth Mackenzie, 1st Lord Kintail, about 1602, after a siege, and only its ruins remain. A hall-house, rectangular in plan, measuring c. 100ft by 30ft, with a late cross-wall toward the W end. To the east of the cross-wall, the walls stand about 20ft high, with gaps. To the west of the cross-wall only early foundations remain, with a garde-robe chute (visible from the rocks below) at the NW corner. Walls are about 4ft thick. A mound of rubble lies at the E end. Information from Hugo D Millar, Glasgow Archaeol Soc, 14 May 1964. Strome Castle is generally as described above. It was presented to the National Trust for Scotland in 1939. Visited by OS (W D J) 18 October 1966. A piece of vitrified rock from Strome Castle is in the National Museum of Antiquities of Scotland [NMAS] (Accession No: 19D-9755). Glasgow Art Gallery & Museum Annual Report 1966. 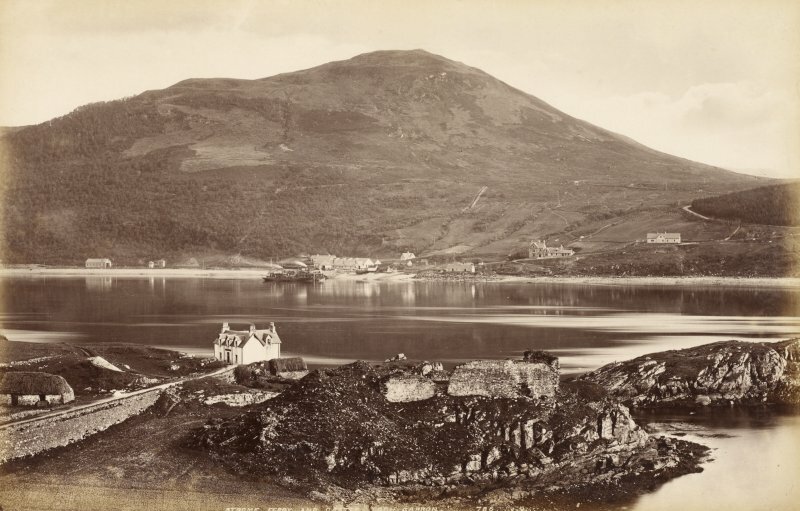 In order to examine the archaeological potential of Strome Castle, destroyed in a siege in c 1602, a short programme of trial excavations was carried out in early September 1994. Considerable evidence of several distinct phases of construction was observed in the hall elements. Structural remains of a tower, buried beneath the rubble at the castle's E end were uncovered. A collapsed sandstone arch from around a blocked doorway was present in the tower's W wall. In addition a rock-cut well was located to the W of the tower mound and partially excavated. A trench located inside the main hall uncovered rubble representing levelling material laid down after construction of the S wall. A flint flake and fragments of vitrified rock were recovered from this trench although no further evidence was found of a prehistoric structure. A detailed plane table survey at a scale of 1: 100 was carried out of the castle ruins, the rubble mound containing the tower, the rocky outcrop they sit upon and the substantial lumps of masonry and general collapse in the surrounding area. Sponsors: NTS and Highland Regional Council. Driscoll, Will and Cullen 1994.